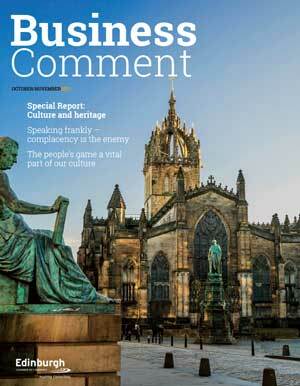 Business Comment is the Edinburgh Chamber of Commerce’s bi-monthly magazine. 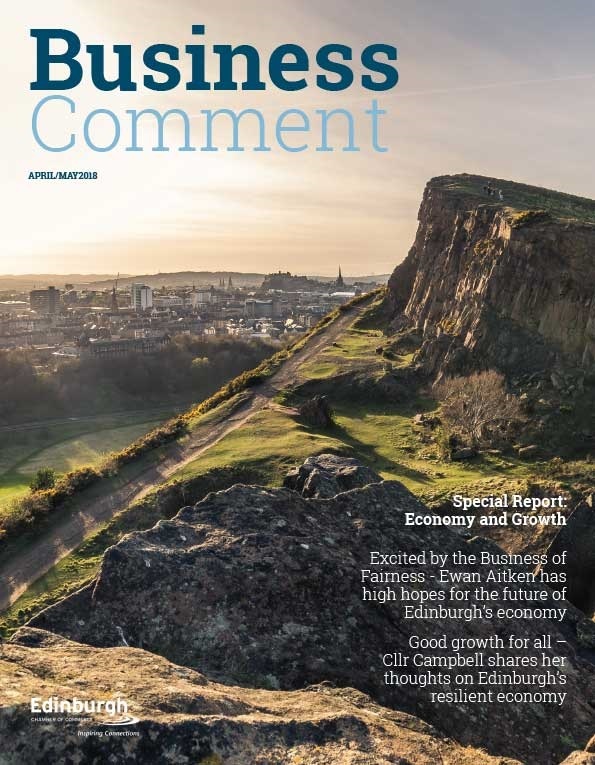 It provides insight on Edinburgh’s vibrant business community, with features on the city’s key sectors, interviews with leading figures and news on business developments in the capital. Our magazine is produced by Distinctive Publishing. For more information and to enquire about advertising, please contact Distinctive on 0191 580 5990, referencing Business Comment. Edinburgh Chamber members benefit from a substantial discount on any advertising. In this issue, we examine how we grow our economy – and how we do that in an inclusive, responsible and sustainable way. To illustrate, we focus on two key areas: The vital part that data driven innovation is going to play in all our futures, and we look at the increasingly blurred lines between the public, private and third sectors in which our charities operate in an environment which demands increasing commercial abilities. 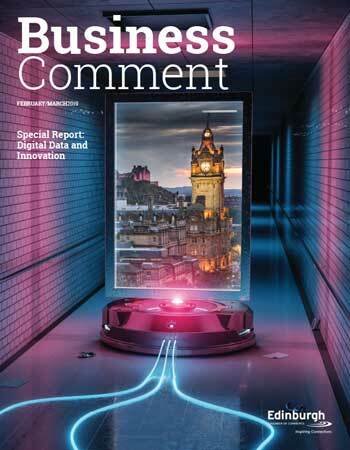 In this issue, we examine the enormous potential of data driven innovation for Edinburgh. Our city has set its sights on becoming the data capital of Europe in future years, driven largely by the excellence of our universities in this field, particularly the University of Edinburgh which enjoys global eminence in big data and artificial intelligence. In this issue, we’re looking at community and collaboration. At how businesses can work together with each other, and how they work within their communities. In particular, we look at the real benefits that can be gained by businesses setting aside their normal and understandable caution in favour of taking a bolder, more collaborative approach. 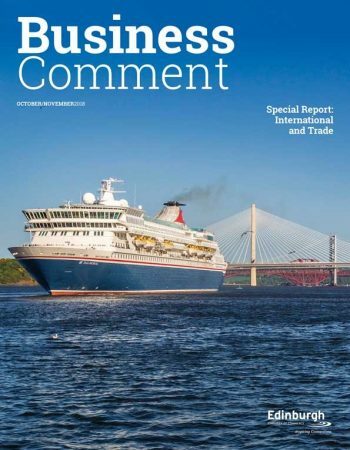 In this issue, the publication focusses on International Businesses. The timing is appropriate, as the time for Brexit draws closer with no real clarity yet on the horizon to help guide businesses operating in an increasingly globalised marketplace. 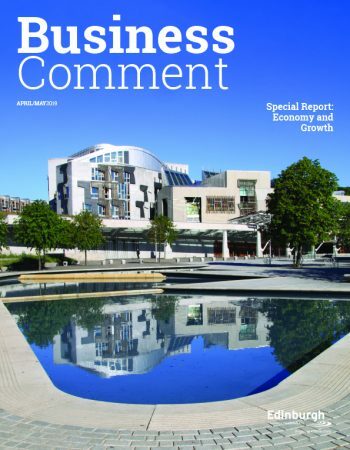 In this issue, we look at something which is of shared and vital importance for all businesses, large and small – the thorny problem of attracting, training, developing and retaining skilled and talented people who can help our businesses grow. 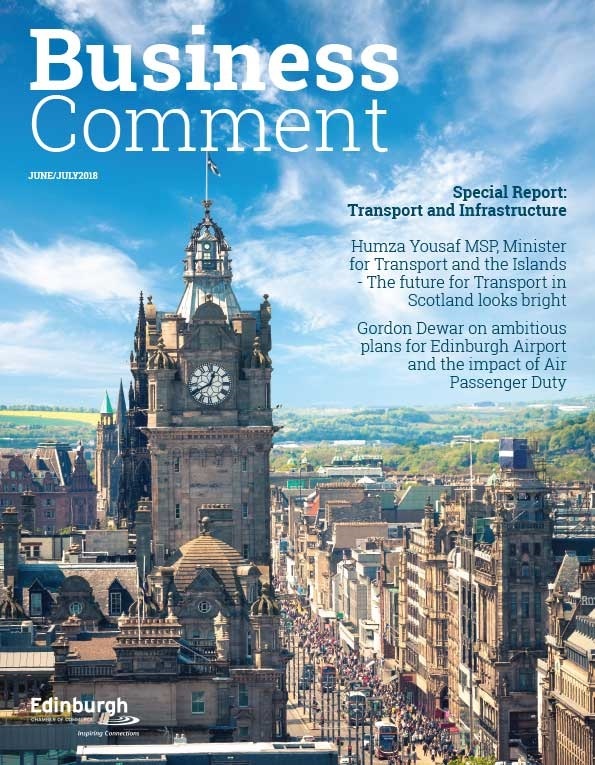 As businesses, we appreciate the vital role played by transport in our commercial lives – from getting people to and from their place of work, linking the supply chain, right through to providing our city with global connectivity perfectly illustrated in this magazine by Humza Yousaf, Minister for Transport and the Islands, who believes the future of transport in Scotland is bright with ambitious plans for 2032. 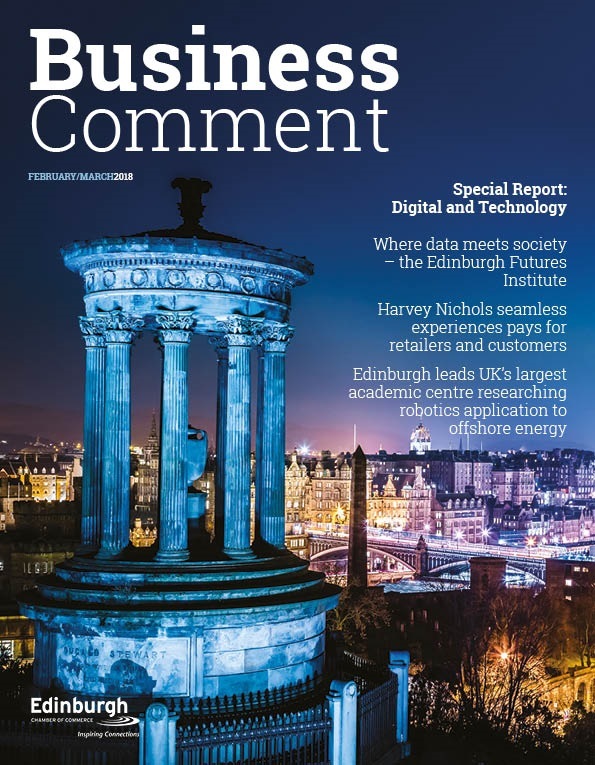 In this issue of the magazine, we provide a taste of the innovation which is going on in Edinburgh to ensure the city is successful now and into the future. For example, Openreach have chosen Edinburgh as one of the few cities to launch their superfast broadband Gfast technology, with download speeds up to 7x the UK average. If you want to know what that looks like – it means downloading a two-hour, HD movie in just 90 seconds. 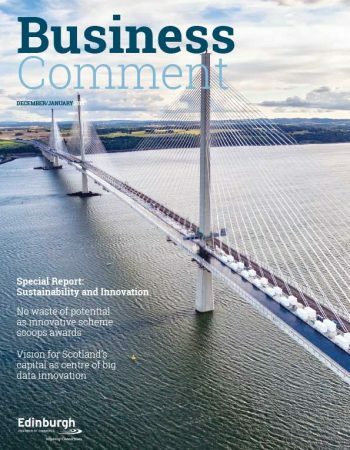 Welcome to this issue of Business Comment, focused on the work of your Chamber and its members in innovation and sustainability. Creating new and sustainable ways of doing things, doing things better, and reducing waste from our systems are business critical issues – but they affect every facet of life. 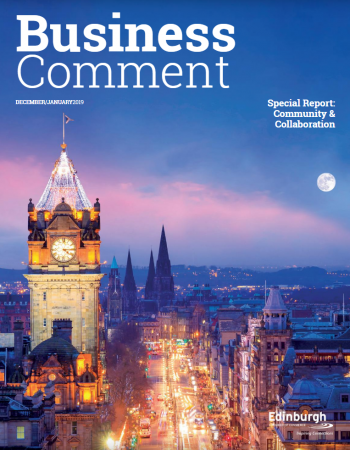 This issue reflects and focuses on our city’s internationally renowned role as the world’s leading festival city, and looks at the role played by culture and heritage in Scotland’s Capital and in its continued success now and in the future.